As Mary Evans leafed through a box labeled “Vietnam,” she verbally connected the dots along her American Red Cross volunteer contributions, from Memorial Day at the Milwaukee VA in 2018 to her stint as a “Donut Dollie” exactly 50 years ago. Mary Evans, SAF volunteer, holds a snapshot taken in Vietnam during her time as a Donut Dollie. In the box, amid the color pictures: scenes of Evans with G.I.s in front of Christmas trees covered in tinsel during downtime; a trio of soldiers around Evans, two smiling and one solemn, posed in front of endless barracks. In black-and-white photos: a band rocking out, followed by a shot of Evans, in Red Cross stylized dress, in front of a lineup of military trucks. An illustrated “Pocket Guide to Vietnam” tour book. A laminated Red Cross “Emergency Identification” issued under Evans’s maiden name, de la Forest. Evans, who lives in Milwaukee with her husband, John, shared the memories from five decades ago in part to keep alive the service of the Donut Dollies, but also in hopes to inspire others to volunteer for service members through the Red Cross. Click here for a list of veterans and active duty resources from the American Red Cross, as well as to find out ways you can help. Through a Red Cross program called Supplemental Recreation Activities Overseas, American women volunteered to bring refreshments, entertainment and a flash of cheer to military servicemen during the Vietnam War. They were dubbed “Donut Dollies” by service members, a name that stuck, though their goodwill work amid the trauma of war is sometimes misremembered or lost. Mary Evans, center, poses with some of the soldiers she worked with in 1968 as an American Red Cross volunteer in Cam Ranh Bay, Vietnam. Evans said she “felt something was missing” in her life in spring 1968. Graduated from college and working at a bank in San Francisco, she wanted to get involved in a positive way in the war that served as a flashpoint for one of the most chaotic years in global history. Compelled to do something for those in military service, Evans called an American Red Cross office in northern California. And, “six weeks later, I was on my way” to Cam Ranh Bay, Vietnam, off the South China Sea. Evans and the other Dollies would put together 50 minutes of games, activities and entertainment, amid their namesake snacks and refreshments, at about six U.S. Army sites per day, five to six days a week. There was plenty of time for competition in the activities, and conversation throughout their visits. Evans said she felt the enlisted “lifers” were more lonely and appreciative of the lifeline to something outside of war when the Dollies came. They frequently ran into soldiers at a high or low, as she said they often presented their programs immediately before or after soldiers took leave. In a warzone, Evans hesitated to call their volunteering dangerous. But it was clear they were far from home. A 1968 American Red Cross I.D. for Mary Evans (nee de la Forest). Evans remains active with Service to the Armed Forces volunteering in Wisconsin. “Jeeps, trucks, choppers … MPs would pick us up and they would drive us back for several miles to our center. There were flares going up across the Bay, but I felt safe almost the whole time,” she said. When Evans’s father passed away suddenly, her stint in Vietnam ended so that she could come home to help her mother and family. As free time cropped up, she returned to volunteering with the Red Cross at a medical hospital near her home in Santa Rosa, Calif. Although she couldn’t return to Vietnam with the Red Cross as she had hoped, while stateside she was able to stay in touch with fellow Donut Dollies and Army service members as they returned. Years on and starting her own family, Evans moved to southeast Wisconsin. It wasn’t long before she dialed the local Red Cross to see how she could contribute, once again for those who served. This call brought her to the Milwaukee VA Medical Center, where, during Red Cross volunteer activities, she’s been able to get to know Jaime, a former Tuskegee Airman, and Norm, a combat-wounded veteran with a penchant for polka music. In a different way than her Donut Dollies days, these Wednesday mornings at the Milwaukee VA gave her the sense of providing relief and escape for service members. “It’s not so much looking back at what they did or what we did. We’re mainly thanking them for their service,” she said. Mary Evans and her husband, John, at left, shared lunch with veterans and fellow Red Cross volunteers at the Milwaukee VA on Memorial Day 2018. Evans has slowed down with volunteering in the past year, with time focused on a few family matters. But she did participate with other Red Cross volunteers in the big Memorial Day barbecue at the Milwaukee V.A. in 2018, bringing meals to vets unable to make it outside. And her foundation in giving herself to service members and veterans hasn’t wavered since the ‘60s, said Richard Seymour, Service to the Armed Forces program director, Wisconsin Region. Find out how you can become a Service to the Armed Forces volunteer here. 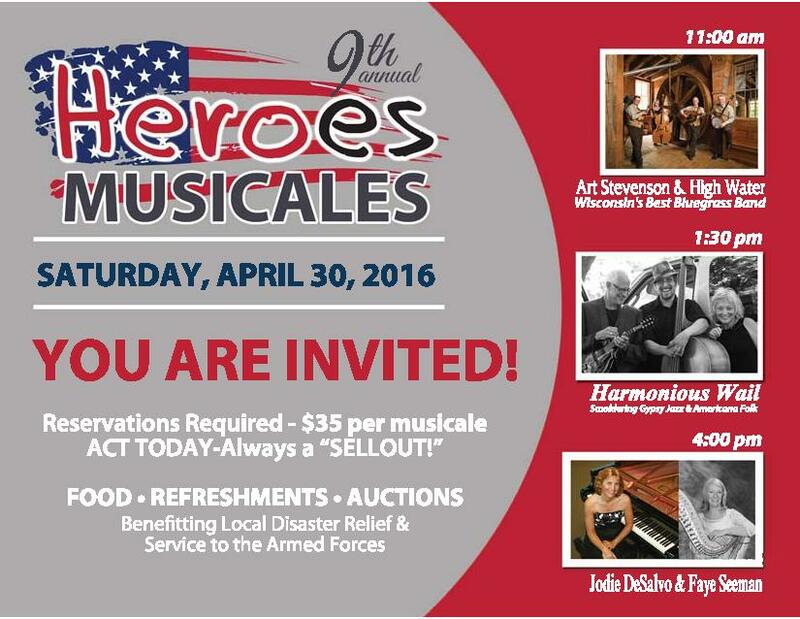 You’re Invited to the 9th Annual Heroes Musicales Extravaganza! 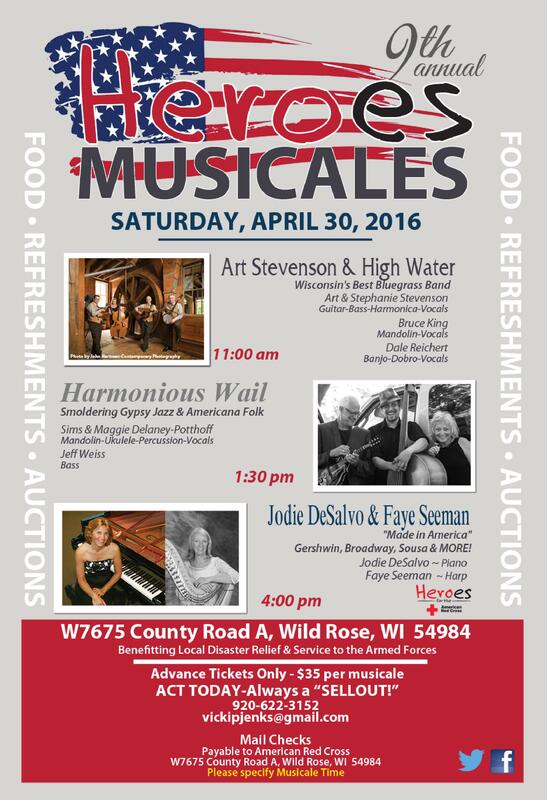 Beautiful Waushara county isn’t just for antiquing, water activities, quaint restaurants and lovely family-run B & B’s and hotels, we’re the center of the musical world on Saturday, April 30th. Especially if you like world-class musicians, delicious hors d’oeuvres, refreshments and more than 200 silent auction treasures, please join us at the 9th Annual Heroes Musicales at the log home of American Red Cross volunteers Vicki & John Jenks just west of Wild Rose. Three Musicales (mini concerts) from Wisconsin’s Best Bluegrass Band, a trio back by popular demand who are NPR ‘regulars’ plus a Carnegie Hall pianist and Chicago’s finest harpist will delight your senses. This volunteer driven event has the local support of businesses, organizations, churches and philanthropic citizens alike. Proceeds from the day support Disaster Relief & Education along with Services to Armed Forces! 11:00a.m. Features the down-home, authentic sound of Wisconsin’s Best Bluegrass Band, Art Stevenson & High Water. Heard on bluegrass radio programs around the USA, they’ve received critical acclaim in Bluegrass Unlimited and Bluegrass Now industry publications. 4:00p.m. Carnegie Hall virtuoso pianist, Jodie DeSalvo and Chicago’s finest harpist, Faye Seeman. Their “Made in America” show will include Gershwin’s ‘Rhapsody in Blue’ and so much more! The Heroes Musicales were conceived by John & Vicki Jenks nine years ago as a way to marry their passion for music and the communities need for disaster relief and education programs. Since then, this event has grown with outstanding support from Waushara, Green Lake, Marquette and Waupaca County disaster volunteers along with this year’s sponsors: Badger Mining Corporation, Farmers State Bank, 1st National Bank, Martz Insurance, Waupaca Foundry, Brakebush Brothers, Krause Foundation, Mt. Morris Holden WELCA. All Saints CCW, Anita & Lawrence Mielke Memorial Fund, John Gusmer, Jackie King, Rose Wendt, and Rick & Joni Parks. Seats are limited and always sell-out! Reserve your seats now at just $35 per person/per musicale. To order, please email Vicki Jenks at vickipjenks@gmail.com or call 920-231-3590. Congratulations to Rachel Goodrich, the February 2016 Volunteer of the Month! Many of us have a great appreciation for our military service members who have so proudly served our country, but how often do we actually reach out to say thank you or lend support to them and their families. Since July of 2013, Rachel has been doing all this and more, as a Red Cross SAF ‘Services to the Armed Forces’ program volunteer. Rachel encourages others to get involved with SAF, “The more volunteers we have the more help we can offer our Veterans and their families. It truly is a life changing experience!” Thank you, Rachel for continuing to proudly represent the Red Cross in your community and for giving back to so many military service members with your heartfelt compassion. Right now, the American Red Cross has many volunteer opportunities, including becoming a disaster responder, supporting military troops, and many more. Red Cross volunteers are united by their service and the feeling that in changing others’ lives, their lives are also changed. To learn more, visit www.redcross.org/volunteer or contact the office of Volunteer Resources at volunteerwisconsin@redcross.org.